Juan Miguel Villar Mir is President, Chairman and Owner of Grupo Villar Mir. The Group has 26,736 employees worldwide and owns several leading international companies in different sectors including OHL, Ferro Atlantica, Grupo Fertiberia and Grupo Villar Mir Energía. 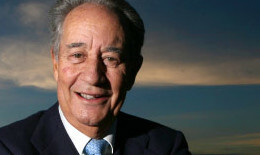 His career spans an impressive list of companies including Electra de Viesgo, Altos Hornos de Vizcaya, Hidro-Nitro Española, Empresa Nacional de Celulosas, Empresa Nacional Carbonífera del Sur, Cementos del Cinca, Cementos Portland Aragón and Puerto Sotogrande. Mr Villar Mir holds a Doctorate in Civil Engineering and degrees in Law and Management. He was Vice President of the Spanish Government for Economic Affairs and Minister of the Treasury Department in the first transitional government of the Spanish Monarchy (1975 – 1976). Mr Villar Mir has received several accolades for his career including the Gold Mercury Award ‘Ad Personam’ for excellence in governance, the Great Cross of Civil Merit and the Distinguished Order of Carlos III.